Have people always come to you for help and advice? Learn how to better the lives of others, to open new positive doors for them through spiritual counseling and psychic advising. Work from home choosing your own hours, charging by the minute or the hour as a private counselor. You may legally set up your own in-home practice, work at a New Age Bookstore, start an online telephone counseling business with Keen.com, or seek employment with the 900 industry. With our two-week homestudy course you can realize the dream of a career in the New Age/Metaphysical Field. We verify credentials for Keen all the time, so your listing with them would get the distinction of “verified” thus getting much more attention than other unverified listings. 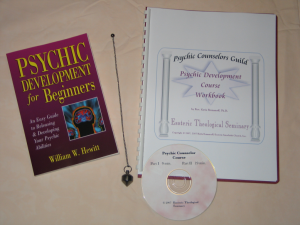 The Psychic Counselors Course actually increases your psychic intuitive skills, enabling you to provide accurate psychic readings for anyone. The total cost of the course is $150.00. That includes the course materials mentioned above, and shipping and handling. After you complete the course, we send you a legal certificate declaring you a Certified Psychic, and a wallet ID miniature certificate. Also, you have the life-time option of placing an entry in our website’s free Practitioners Directory, viewed by thousands. Please fill out this application to order your homestudy course. Courses are shipped within 1 to 2 days from the time we receive your completed, paid application. Also available: Dream Interpretation Homestudy Course and How To Become A Professional Tarot Reader. For information about those courses, email us. Thank you so much! I loved it. I will redo (read entire book) this every once in a while. What wonderful truth and information as I learned a few things. I am VERY pleased. I am finished with my test and will send it out tomorrow.